Just one of the many stained glass dome designs offered at Stained Glass Inc. 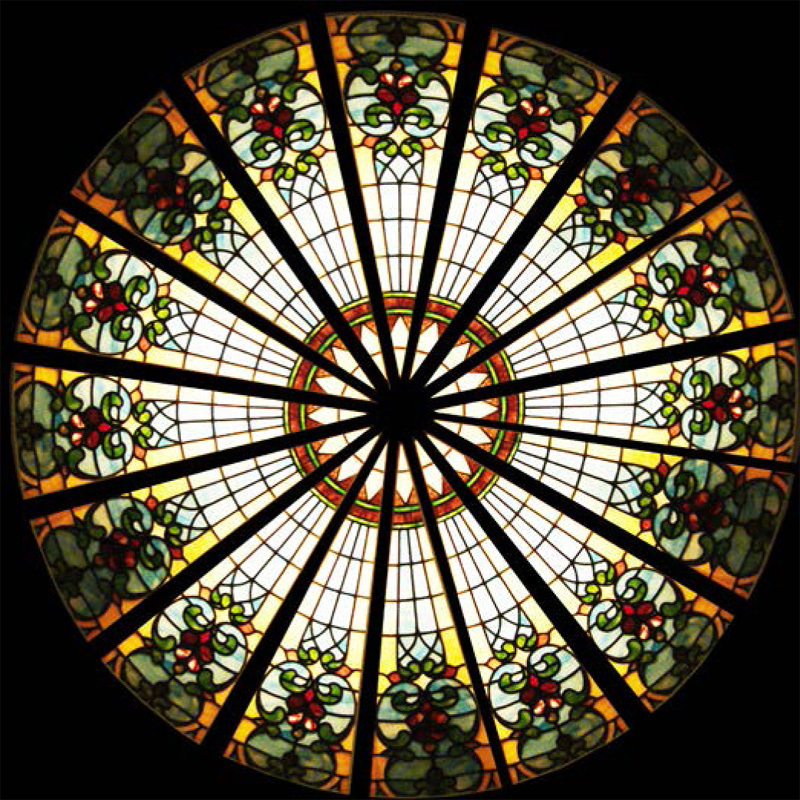 Whether you have a restaurant, hotel, casino, retail center, church or government building project, you will be sure to offer a dramatic and engaging ambiance when you install a stained glass dome. • What architectural style is your building? If it’s art deco, classical, modern or some other style, you would want a stained glass design that reflects that same style to tie the look all together. • What is the building used for? If it is a religious structure, then you may want to add some type of religious stained glass design. Or, if it is a government building, perhaps the stained glass design may have something that symbolizes that. 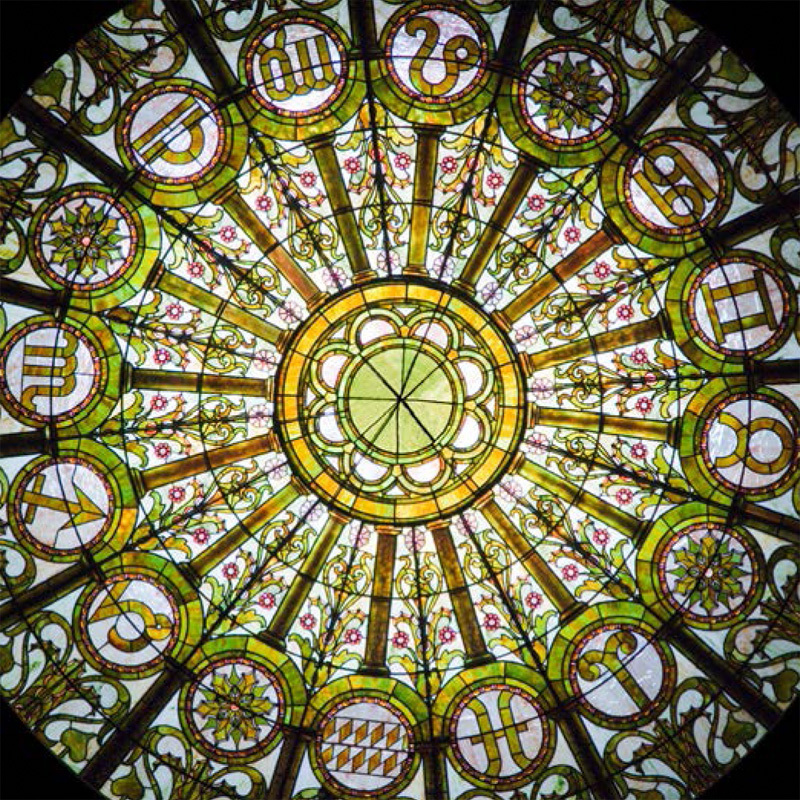 If you are adding a stained glass dome to a university, you may want to add some university symbols or mascots to the design. • Will you be using natural light or an artificial light source to light your dome? Different designs tend to work better under each type of light or there are some that work well if you plan to use both natural light and artificial light to bring the stained glass dome to life. • Are there particular colors you could use to emphasize a company’s corporate identity or align with your brand? This can further your brand message as well as enhance the overall ambiance of your structure. 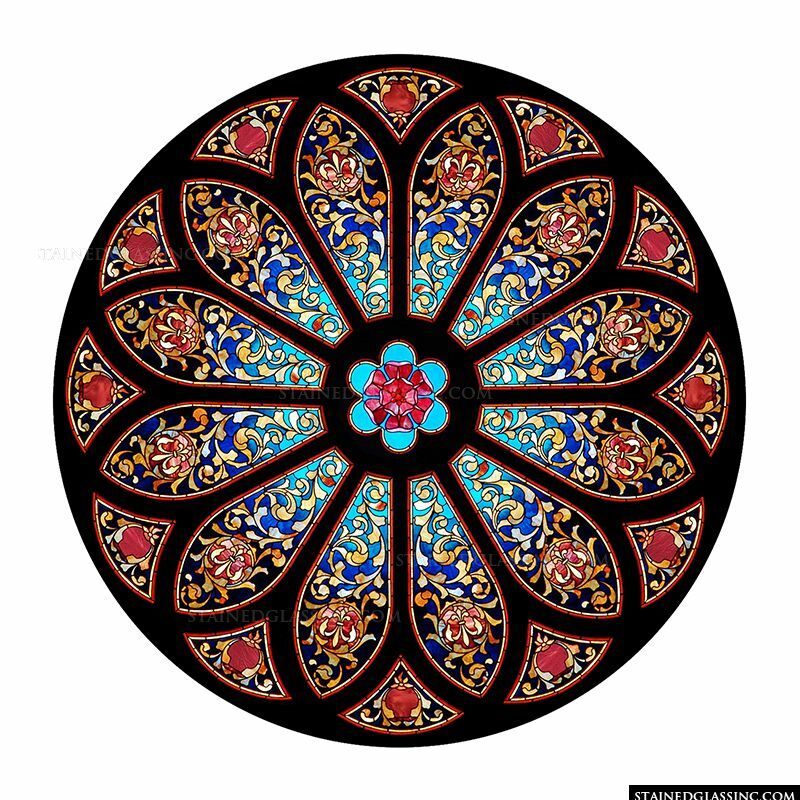 At Stained Glass Inc., we offer thousands of different stained glass designs, including religious stained glass dome designs and non-religious stained glass designs. Within our stained glass design catalogue, we also feature specific themes like nature or abstract as well as those that emulate a certain stained glass style like Tiffany or Frank Lloyd Wright. 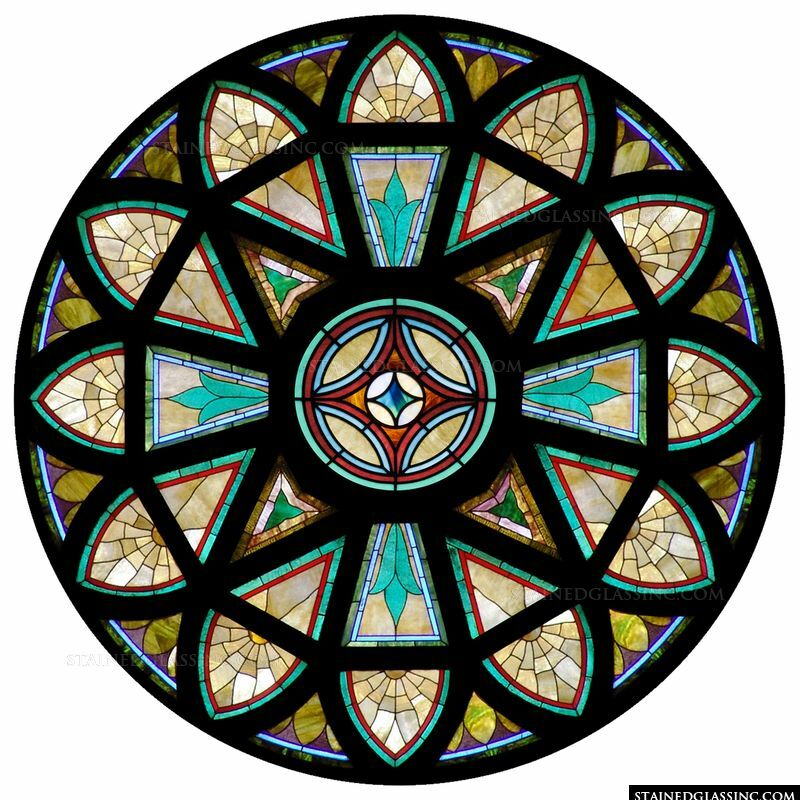 Of course, our stained glass professionals can also create a custom stained glass design for your dome based on your ideas or a specific pattern that you have developed. You can work with our stained glass team and create something that fits your ideas and works within our modular design system for our stained glass dome manufacturing process. • We do not use lead in any of our stained glass. • Our stained glass is made from polymers that are much more durable than glass as well as rich mineral pigments that are designed to last longer in terms of the brilliance and color consistency that they offer. • We have a process for creating stained glass domes that uses a modular construction so you can easily install the dome without construction or further remodeling. 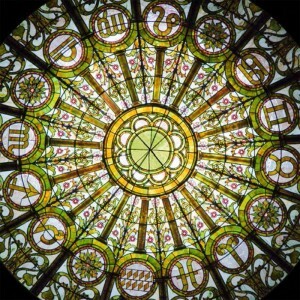 To learn more about designing a stained glass dome, including using one of our designs or creating your own, or to receive a free estimate, please fill out our contact form or call our team of stained glass specialists at 903-454-8376. This unique and colorful design is perfect for use as a stained glass dome. For everything from restaurants, casinos, and hotels to universities, libraries, and government buildings to churches and shopping centers to even homes, stained glass domes provide light, beauty, and inspiring ambiance. With a diverse catalogue of stained glass dome styles and designs, we are sure to have what you are looking for to fit your construction or remodeling project. Our stained glass domes come in many styles that reflect different architectural periods and forms. For examples, we have stained glass domes that emulate Tiffany as well as Frank Lloyd Wright. We also offer modern, contemporary, abstract, traditional, religious and non-religious stained glass styles. 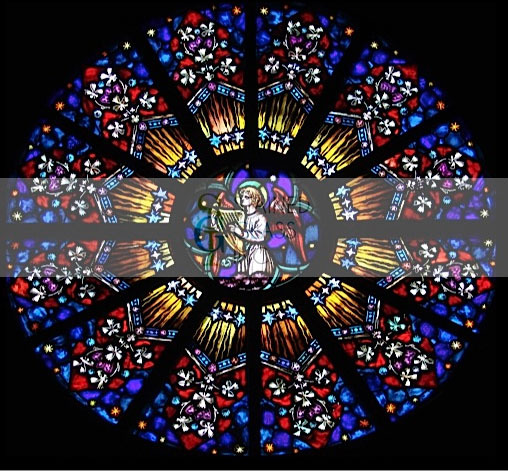 To provide that rich aesthetic sense to your structure, our seasoned stained glass design team has already developed an extensive collection of stained glass dome designs that cover many themes, including religious imagery and non-religious designs like nature, mosaic, kaleidoscope and more. The stained glass designs for domes offer a brilliant array of colors that can be highlighted by natural light or they can be backlit with LED lighting. The color palette is seemingly endless with everything from bold and rich hues to pastels and luminescent shades of white. Our master stained glass artists have years of experience developing these stained glass designs, perfecting the art of stained glass and selecting only the finest mineral pigments to use. Besides the styles and designs offered in our catalogue for stained glass domes, we can also create a completely custom stained glass dome. This provides you with a way to enjoy a signature stained glass design, helping your stained glass stand out even more. Our stained glass designers and master craftspeople work directly with clients on coming up with the perfect design. We offer complimentary stained glass design consultations as part of our regular service. Because our stained glass domes are made from modular pieces, they can be combined in just about any way to make the size of dome that fits your space. As part of the consultation process, our team of stained glass specialists is happy to answer any and all questions you may have related to stained glass specifics. Beyond the amazing artistry and extensive collection of stained glass dome designs, our stained glass offers a significant advantage over other companies. It is completely lead-free and environmentally friendly, offering a way to reduce drafts and lower energy costs. Additionally, our stained glass is made from polymers that are much stronger than traditional glass and have passed numerous safety standards, providing durability and impact resistance to stand the test of time. Our stained glass design, ordering, and installation process is easy. Start with a free estimate today for your commercial or residential stained glass dome project to find out how you can enjoy the illuminating and stunning colors of stained glass domes. Fill out our contact form or call our team of stained glass specialists at 903-454-8376. Basic drawing for stained glass dome assembly. Whether used for residential or commercial applications, stained glass domes provide a way to brighten a room or space as well as add beauty and ambiance through dramatic colors and artistic patterns. Our stained glass domes are safe, lead-free, and 200 times stronger than leaded glass. Each one is made with the finest details and has undergone UV lab testing that shows that the stained glass dome can be exposed to ten years of UV light without fading. Our stained glass domes are also lightweight and shatter-resistant. While you may think that stained glass dome installation may be cumbersome, time-consuming, and complicated, we have the assembly and installation process down to a science so you do not have to do any ‘heavy lifting.’ This is because we have developed a modular process for installation that does not require major construction or remodeling to add a stained glass dome to your structure. 1. Assemble the metal frame. 2. Bolt the base ring together, following the matching lettered parts on each component. 3. Bolt the longitudinal ribs at the center ring together. Do the ribs on the opposite sides first to add stability to the stained glass dome frame and then finish off bolting together the other ribs. 4. Add the polymer stained glass panels. These are attached with nuts and washers to threaded anchors. 5. Add black silicone at the joints where the stained glass panels meet the frame of the dome. Before ordering and installing your stained glass dome, it is recommended that you still ensure you are meeting local building codes. 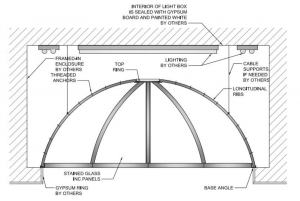 Before ordering your stained glass dome and assembling it, you will need to consider where to place it in your structure to get the desired light level. 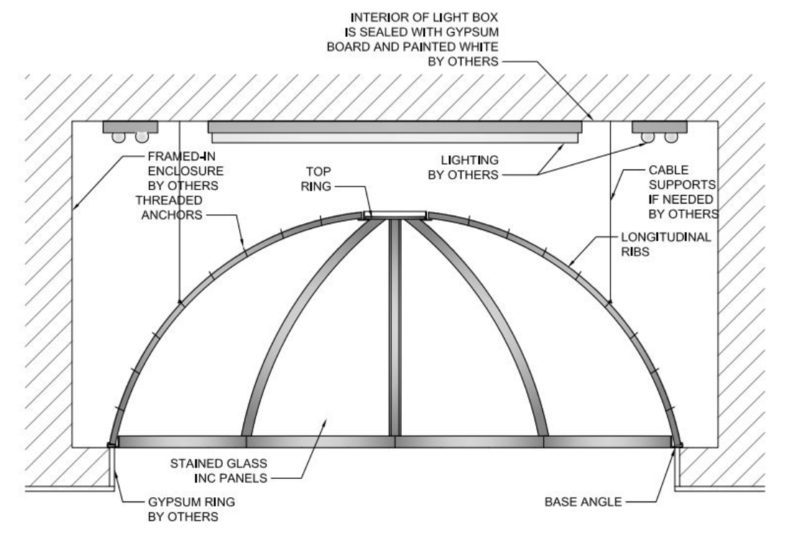 For stained glass domes placed under a skylight, it is important to make an enclosed box to seal the light shaft between the dome and the skylight. Of course, if you still want to show off the stained glass dome in the evenings, you will need to add a lightbox as well for nighttime viewing. For those domes installed with a lightbox, you can add both dimmable LED lights and florescent lights, which allow you to change the light intensity throughout the day or evening to create different levels of ambiance for the space. To ensure you get even lighting, keep the light sources away from the dome panels as much as possible. This means leaving at least 8-10 inches of space between the dome panels and the light source. This will allow for the light to indirectly illuminate the back of the dome. To learn more about custom ordering, shipping, and installation, please contact our team of stained glass professionals who are happy to assist you with any questions or concerns. We also offer free estimates for stained glass domes. You can reach us through our contact form or by calling 903-454-8376. Colorful stained glass dome design provided by Stained Glass Inc.
Found in commercial and residential spaces, stained glass domes offer a way to illuminate a space in a beautiful way through an array of colors and effects. 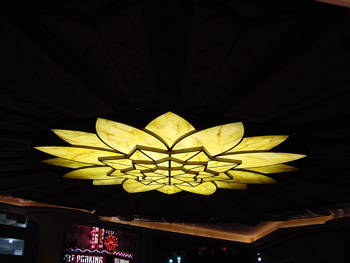 This feature can be added to a meeting space, chapel, classroom, office, hall, sanctuary, restaurant, casino or even a home. Adding a stained glass dome does not have to involve major construction or remodeling. Instead, there are different types of stained glass domes available that allow you the option of natural light, artificial lighting, or even a combination of both. Stained glass domes can rely purely on natural light. They can be added below an existing skylight or opening in your structure. This provides easy installation while adding beauty through one or more stained glass designs. An additional benefit of using a naturally lit stained glass dome is that it can help reduce lighting costs for a home or business. While you may think that designing and installing a stained glass dome for your home will be expensive and involve significant remodeling or construction costs, we have made both processes simple and affordable. And, you do not even need a window or natural light source to enjoy it. Accessible both night and day, our LED lighting options use a light box that gives the appearance of a stained glass window. A light box is simply placed behind the dome and mounted to the ceiling to create the light needed to illuminate it. The environmentally-friendly LED lighting can be illuminated with LED lights rated for 30,000 hours of use without having to change a bulb. That is the equivalent to 14 hours of use per week for about 40 years. This can also save on lighting costs for a business and home while allowing the beauty of the stained glass dome to shine any time. There is also the option of combining natural light and LED lighting to enjoy the best of both worlds, using the sunlight throughout the day and then switching to LED lighting so that the stained glass dome can still be used in the evening for an elegant feel. We completely customize everything about your stained glass dome order. That includes the shape, size, design and colors. Whether you choose from our stained glass design collection of religious and non-religious designs or you submit your own stained glass design idea, our stained glass professionals can create it and ship it to you, factory direct. Our stained glass domes meet all code standards for safety and breakage resistance. It’s easy to order direct from the manufacturer and enjoy the affordability and easy installation of our stained glass domes. Learn more about stained glass domes and how they can add light and beauty to your home or business. We offer estimates by filling out our contact form or calling 903-454-8376. Custom designed stained glass dome at Opryland Nashville. Restaurants are always looking for ways to set themselves apart from the competition. One of the ways that dining establishments can do this is through their ambiance—something many diners seek as part of their restaurant experience. 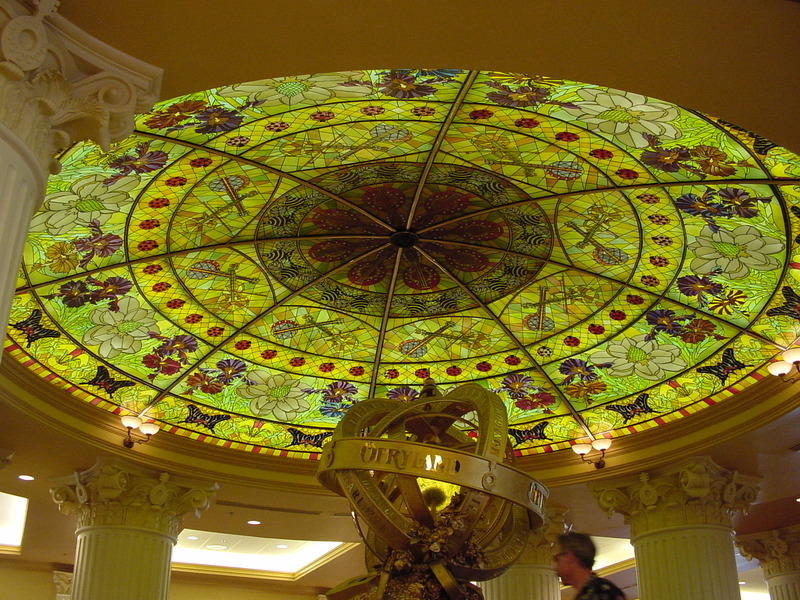 One of the most visually striking ways to create a dramatic look for your restaurant is to add a stained glass dome. As one of the most dramatic architectural features that could be added to a restaurant, stained glass domes provide a unique ambiance for your guests. Imagine how your diners will feel enjoying a romantic meal under the warmth and soft glow of a stained glass dome. The luminous, rich colors of the stained glass dome can be lit by a skylight in your restaurant, by efficient fluorescent and LED lights, or by both. Either way, stained glass domes add color and light to a space that may otherwise be too dark or lack the design aesthetic that sets your restaurant apart from others. Installing a stained glass dome is easy. That’s because the domes have been designed as modular pieces so they can be combined to make any size dome. The panels are designed to work with new or existing grid systems in your restaurant. Even if you are adding a stained glass dome to an existing restaurant, it will not have to undergo construction or remodeling to make it fit. When you receive your stained glass dome, it arrives in prefabricated units. All you need to do is assemble the steel frame and set the modular stained glass panel pieces into the frame. Master craftsmen have created a wide range of sizes, shapes, and designs that are made to fit in with your restaurant’s architectural and interior design. If you do not see a stained glass design among Stained Glass Inc.’s catalog of thousands of designs, you have the design freedom to work with our team to custom create anything that fits your vision. That means using a crest, logo, or specific color palette that matches your existing restaurant décor. There are many advantages to selecting Stained Glass Inc. for your restaurant stained glass dome. As a world-class leader in stained glass, we only use the finest quality materials available and utilize a process that is lead free, providing safer stained glass. Another advantage of working with us is that we offer studio direct prices on completely custom stained glass domes. Ordering direct from the manufacturer provides you with additional value that makes it affordable to add a stained glass dome to your restaurant. For a free estimate or more information on how your restaurant will benefit from the beauty of a stained glass dome, please fill in our contact form or call us at 903-454-8376. Our team of stained glass professionals is available to explain the custom stained glass dome design, ordering, and installation process.